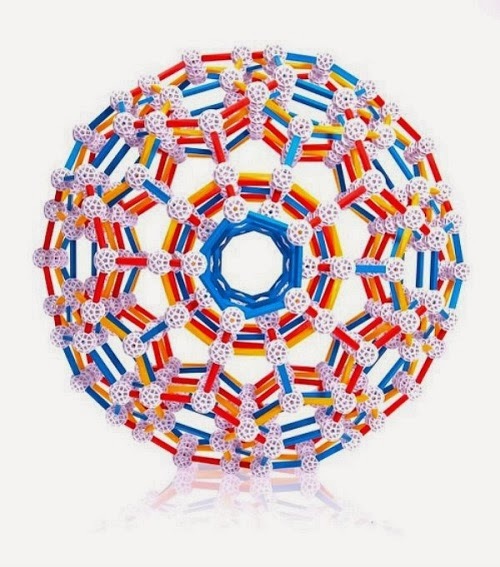 Our Disruptus game inspired us to become bolder in our creative play AND home decor too! DOES: Makes you happy whenever you look at it and it also tells time! Every room in my home has a painting but my room. I don't know why but I just couldn't commit to anything. But I knew I needed another clock and so I found this super cheap DIY clock while I was trolling through Amazon for the millionth time. You get paper guide that allows you to put the numbers up without measuring. I made my numbers a little crazy. The DIY clock looked easy enough to put up and it was just around $5 or $6 and there was no shipping. It sounded unreal but I had to try it. About 3-4 weeks later (seriously) I got it and it was soooooo cool! While the hands became slightly bent through the shipping process. I didn't care. It was cheap and it was going to look sooooo cool. And it did! But #1 Son hated it. I put the numbers in crazy ways (crazier than the picture above) and he was highly disturbed by it. Eventually, a little elf began chipping away at them when I wasn't around. The numbers are made of thick foam and they just stick onto your wall so the clock is never really safe from naughty elf hands. Good things happen to those who sort. 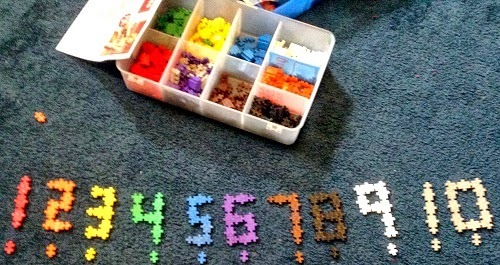 Kids may not have the patience to sort but they can still make something awesome. 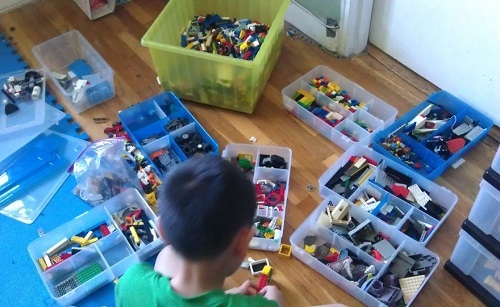 While I may clean off my son's desk or buy him a snazzy organizing folder, I'm now wondering why don't I help my kids organize their building toys more? Clearly there are learning benefits here. Anyway, I discovered that I didn't have to trash my cheapo DIY clock from China. Instead I could use the Plus Plus numbers that #2 made! And there you go. Foam stepped aside to let Plus Plus take its place and since each number was built piece by piece (and NOT GLUED- yeah, Plus Plus is that awesome).... well, all I can say is my DIY clock is now really a DIY clock now! Isn't this the coolest? 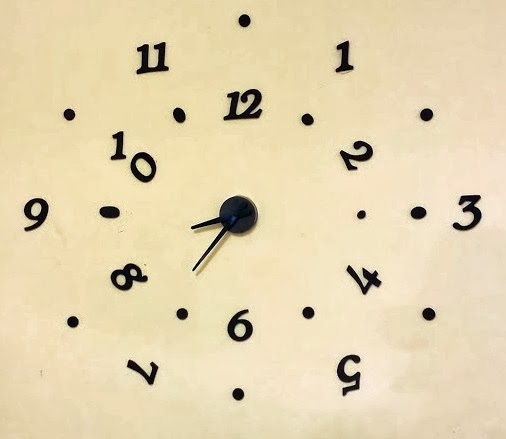 A whole clock with your toys as the numbers! And your kid made them. How can they not be incredibly proud! 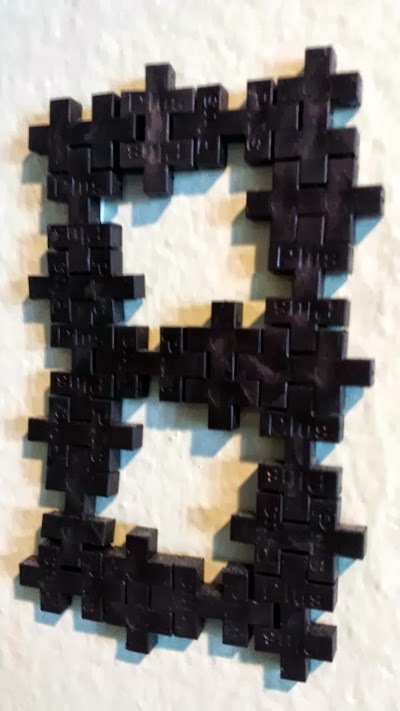 I used tiny pieces of mounting tape to hold it up and I didn't put them on the entire number. 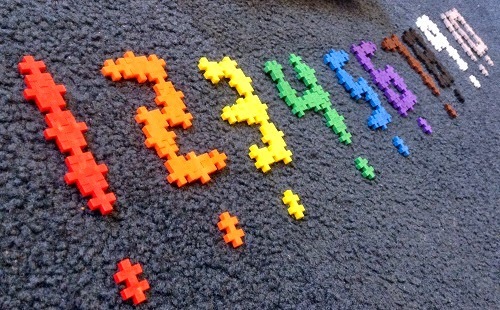 I love how my kids use Plus Plus in 2D. This one is a "medallion" for Batman. I think that is what he said. Can't keep up with their imagination. I'm. too. old. You can do it too! 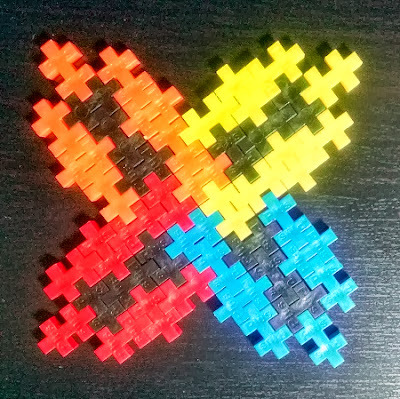 I suppose you can use any connecting building block you want but I love Plus Plus because they stick so well together and they are lightweight so I am certain they won't fall down! 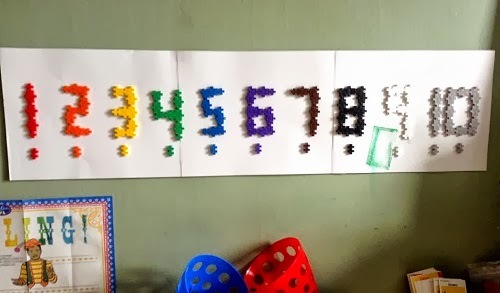 AND..... since you don't have to glue them together to stay put, you can take them down to play with them if you feel like replacing the numbers. We also used mounting tape.We cut them into thin slices and we didn't use much because you don't need much. Plus Plus are lightweight and stick well to each other too. I don't know why there is a green stamp there. My kids are weird. But seriously, there is no glue! Just a little scotch tape is holding this thing up. Read my review of Plus Plus which was a strong finalist last year for Reader's Choice Top Toy of the Year! 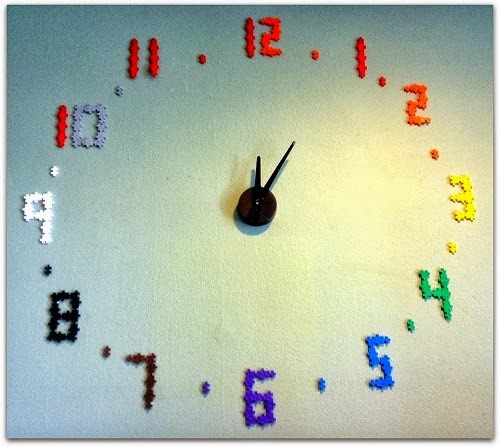 Alter your clock by putting a Plus Plus flower on the 12, 3, 6, and 9 numbers. You can do anything! 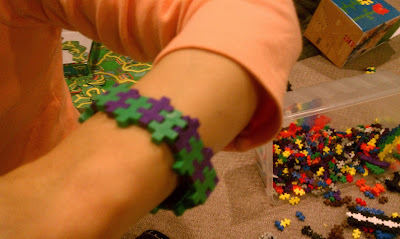 Those Rainbow Loom bracelets are the rage but someday I'm going to figure out how to make a Plus Plus fidget bracelet! I bet it's possible with those rubber bands! 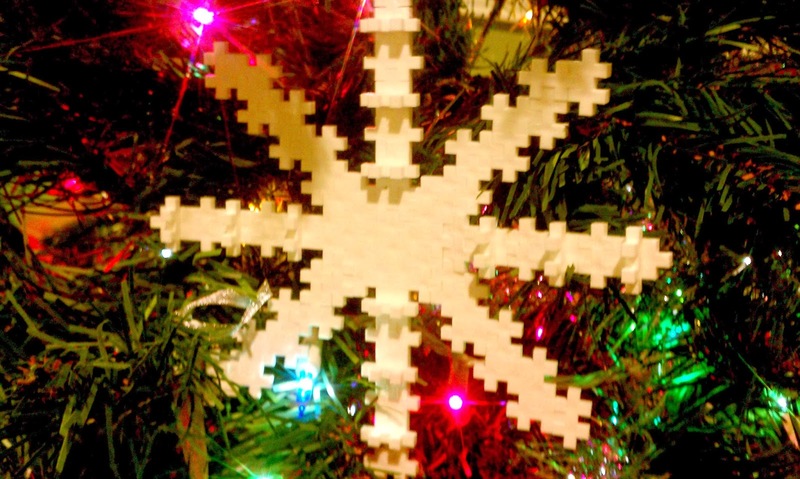 Okay, maybe snowflakes are not supposed to have eight points but you get the message? 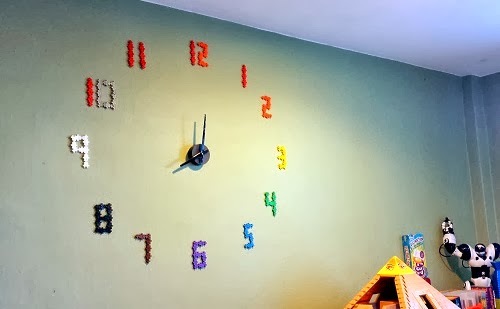 Have your kids make something with their toys that save money and adds to your home decor. It's a visual reminder of their creativity and it looks so much better than some of the so-so drawings that you put on your refrigerator door. Want to get it on Amazon? We have the 1200 (and we bought that one ourselves) and we LOVE it. You will feel like it's enough to make things. Heck, we made a clock! Disclosure: Toys are Tools was not compensated by the manufacturer for the publication of this review. 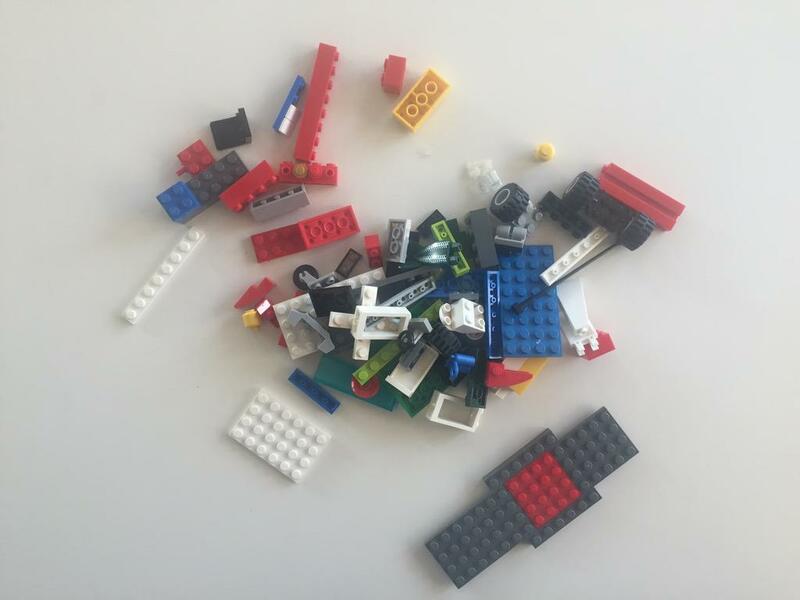 The reviewed items were provided to Toys are Tools to facilitate a review. Reviews are never promised. However, all the items in these photos were purchased by yours truly.